If you consistently make favourable elixir trades with your opponent you will eventually win the game. By favourable trades I mean using a lower elixir cost card to kill a higher elixir cost card. The most well known example would be using Arrows to kill Goblin Barrel. 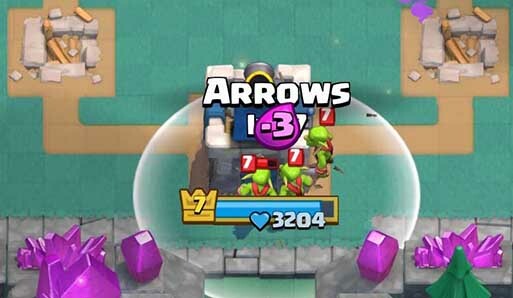 Arrows cost 3 elixir while Goblin Barrel costs 4, after the trade you are one elixir ahead. Imagine you keep playing like this, for every card your opponent plays you counter it with a lower cost card. Since both of you gain elixir at the same rate, you will eventually end up having a full elixir bar while your opponent is out of elixir. That means that you can put pressure on him when he has no elixir to defend with, obviously a very good situation to be in. If your opponent doesn’t have elixir for defence you will kill his towers and win the game. So how do we get in this situation where we have a full elixir bar while our opponent is low on elixir? We keep doing favourable trades all throughout the game, and that is what this article is about. I’m sure most of you are doing favourable elixir trades when playing already, but hopefully you’ll notice a few more profitable trades you can aim for in this article. In this article I’ve chosen to only write about favourable elixir plays, trades where you gain one or more elixir in profit. Lots of plays break even, say killing Goblin Barrel with Fireball. That doesn’t mean it’s a bad play, it’s still the correct play in most situations, but it will not give you an elixir advantage. 1. Arrows to kill Goblin Barrel. I just thought I’d start out with this, since it’s most likely the first trade new players learn about. You use Arrows which cost 3 elixir to kill Goblin Barrel which costs 4 elixir. This will give you a one elixir advantage. 2. Arrows or Fireball to kill Minion Horde. If your opponent plays Minion Horde away from your troops and towers you have an opportunity to make a very favourable trade. Minion Horde is quite expensive to play at 5 elixir. If you kill Minion Horde with Arrows you will gain a two elixir advantage! It doesn’t get much better than this. If you kill it with Fireball, which costs 4 elixir, you will gain a one elixir advantage. 3. Arrows or Fireball to kill swarms of troops. Often you won’t use Fireball or Arrows to just kill one type of troops, in many cases it’s a whole group you will end up taking out. 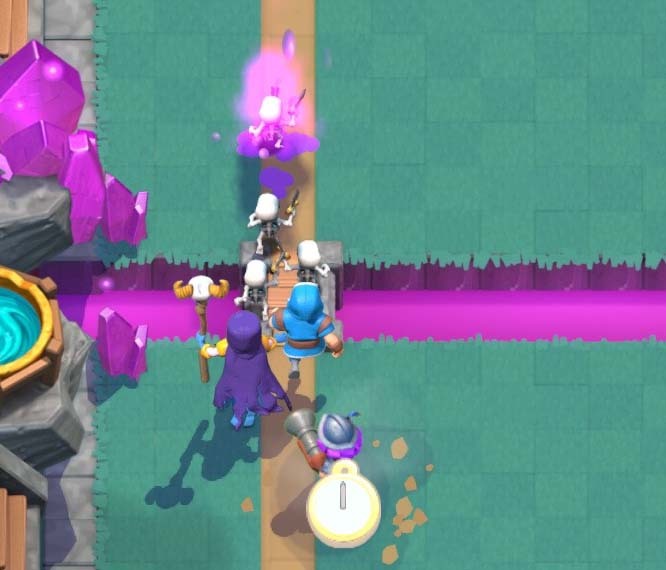 In these situations it’s very hard to calculate exactly how much elixir advantage you gain, if you gain advantage at all. Basically just look at the total worth of troops you are taking out, and if you don’t completely kill them count it as 50% of their elixir worth. If you manage to hit two or more cards worth of troops you can make a big profit. 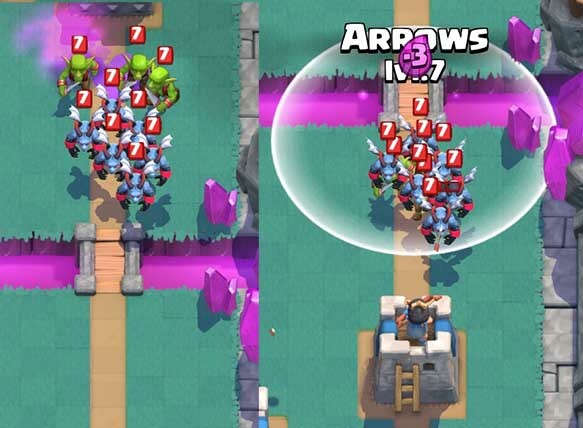 In the situation above you kill both the Goblins and the Minion Horde, 7 elixir worth of troops. This will give you a 4 elixir advantage which is huge! You can get at a disadvantage if you use Arrows or Fireball to kill low cost troops. Killing Spear Goblins that only cost two elixir is bad with both Arrows and Fireball. 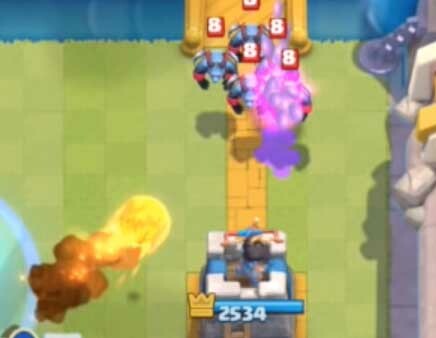 Killing Minions at 3 elixir with Arrows will break even, while it will lose you one elixir if you use Fireball. 4. 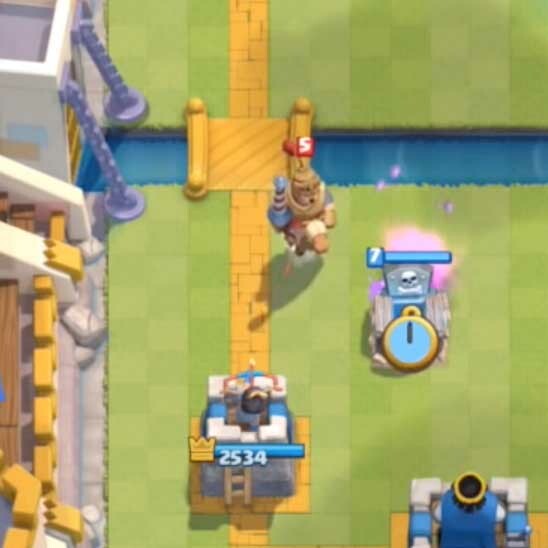 Tombstone to kill Prince, Giant or Hog Rider. This is another very well known trade. Your opponent plays Prince and you put down a Tombstone near your tower. The Tombstone with skeletons will take out the Prince together with fire from your tower. The Prince costs 5 elixir while the Tombstone only costs 3 elixir, which gives you a nice two elixir profit. 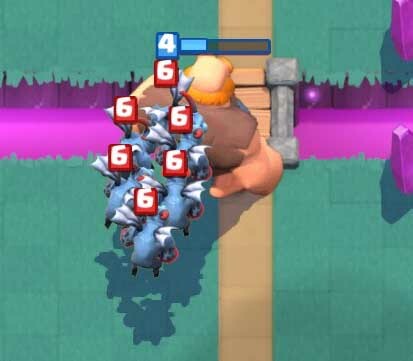 You can also kill the Hog Rider and Giant this way, but the they might still damage your tower as they will run away from the skeletons that are spawned. Even so, you will stil gain an elixir advantage from countering Hog Rider and Giant with Tombstone. 5. Skeleton Army to kill Prince or Giant. Skeleton Army is more expensive than Tombstone, so to kill a Prince the Tombstone is more effective. Killing a Giant works better with Skeleton Army however. 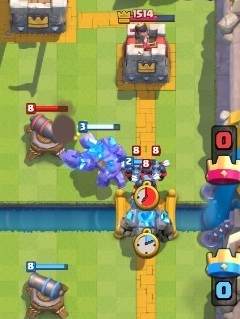 Skeleton Army also does well at taking out a Hog Rider, but they have the same cost so it won’t give you an elixir advantage. Killing a Prince or Giant with Skeleton Army will give you a one elixir advantage, so it’s definitely a good trade. 6. Lighting to kill high elixir cost troops and buildings. Lighting is probably the card that gives you the most options for gaining elixir advantage. There are just so many combinations of buildings and troops Lightning can trade favourably with, so so there is no way to list them all. Lighting costs 6 elixir to play however, so make sure you don’t wast it taking out just one lower cost troop. The image above shows a fairly common way to gain elixir advantage with Lighting. Here we have a Witch and a Balloon near your enemy tower. 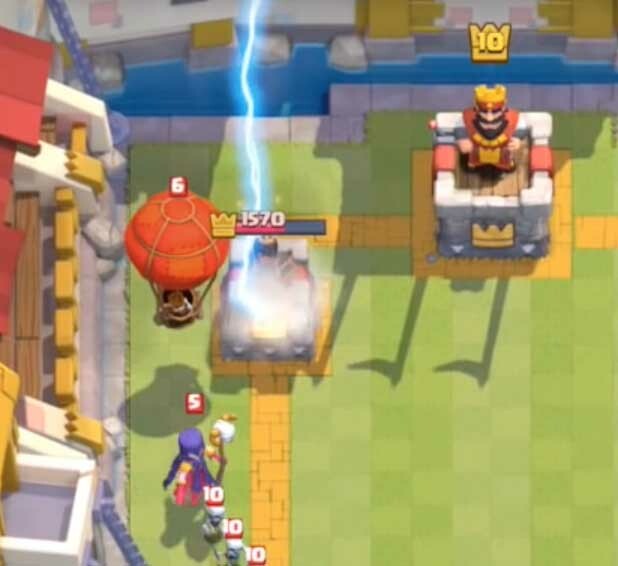 Lighting will take out the Witch, almost the Balloon and deal 300+ damage to the tower. 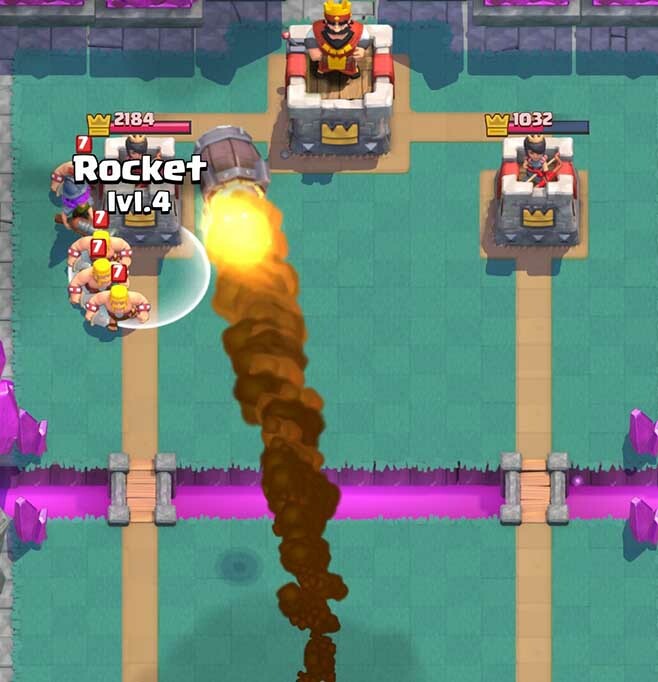 Rockets can also be used to give you an elixir advantage. The area of effect is very small however, so you need to be very accurate when you’re placing it. Rockets cost the same as Lighting, 6 elixir. That means that you usually want to take out two buildings like Elixir Collector and Goblin Hut with it. You can also take out a combination of troops and buildings with Rockets, but due to the small area of effect and long casting time it can be difficult to hit moving targets. In the situation above my Rocket takes out two of the Barbarians, the Witch and damages the tower for 400 hp. 8. Flying troops to take out ground troops. This is another fairly common situation. Your opponent plays Barbarians, Giant, Goblins or similar ground troops that are not able to shoot at air. You play Baby Dragon or Minion Horde and take them out before they are able to do any damage to your troops or towers. This will give you a huge elixir advantage, as you are basically taking out 5 elixir worth of troops without loosing any elixir worth of troops yourself. 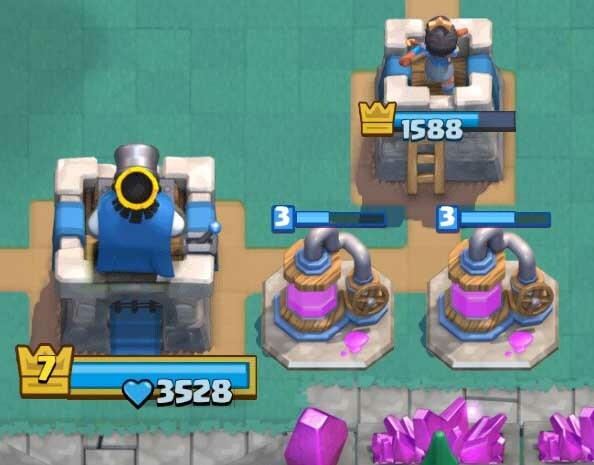 To calculate elixir advantage you would have to look at the whole trade however, often your opponent will take out your troops playing another card and not let them reach his tower. For example, your opponent plays Giant. You take it out at the bridge with Minion Horde. Your opponent then plays Arrows afterwards and takes out your Minion Horde. You would then have spent 5 elixir for the Minion Horde, while your opponent has spent 5 elixir for the Giant and 3 elixir for Arrows. This gives you a 3 elixir advantage. 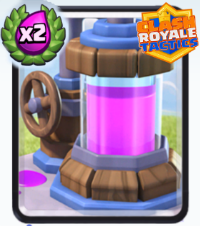 Elixir Collectors is the only card that is made specifically to give you an elixir advantage. The Elixir Collector costs 5 elixir to build and it gains 1 elixir every 10 seconds over 70 seconds. As long as you keep your Elixir Collector alive you will gain a 2 elixir advantage from it. If your opponent uses Rockets or other spells to kill it you may gain or loose elixir depending on when and what other stuff your opponent kills with his spell. 10. Never sit at 10 elixir. If you sit at 10 elixir while your opponent spends his on useful troops you will end up at a disadvantage. 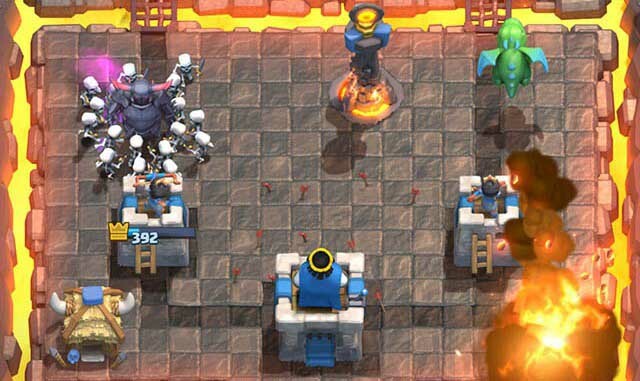 Strictly speaking you won’t be at an elixir disadvantage, but you will end up losing health on your towers as you won’t have troops there to defend them. The whole goal of gaining an elixir advantage is to use it to kill your opponent’s towers while defending your own. When playing Clash Royale and trying to making good elixir trades it’s important to have the end goal in mind. The goal of gaining elixir advantage is to trade that elixir for damage to your opponent’s towers. 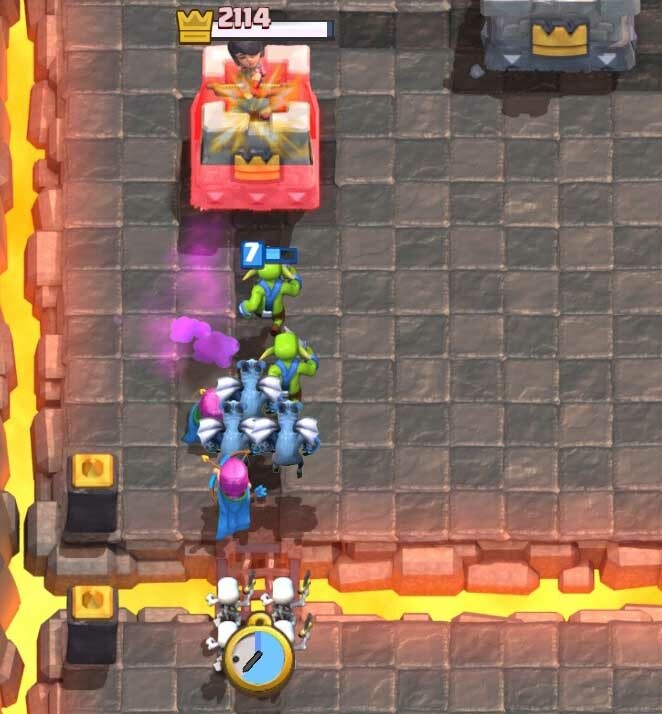 When you have an elixir advantage you want to spend that elixir pushing for damage on one of your opponent’s towers. 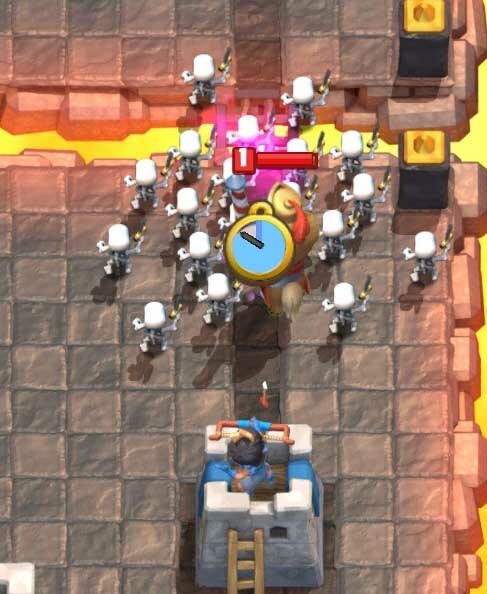 The troops you send will die to the enemy tower after hopefully doing a lot of damage or killing the tower completely. After this your elixir advantage is gone and you have to start building it up again. 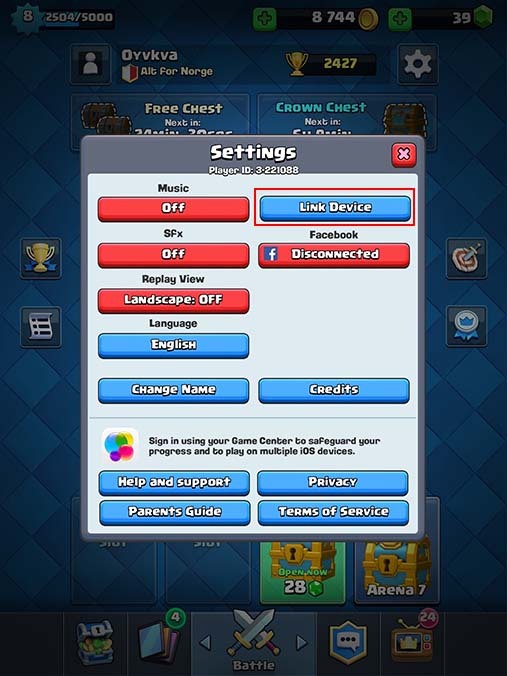 Elixir calculations and deciding how to counter your opponents troops have to be done over and over throughout the game. The player who makes the better decisions when it comes to this, taking time left of the game into account, will eventually be the winner of the game. I’m sure there are a lot of favourable elixir trades you can make that I have not mentioned here. I would love to hear about that in the comments, and also please let me know if you have any other questions or comments. Thanks! One caveat. People play the Giant from behind their towers. By the time itgets to the bridge, he is back at 10 elixer, and you spend 4 or five to start taking him out. So you are now behind. If your opponent plays a card behind their tower, either pressure the other lane or put one behind your tower. If you pressure the other lane, it can stop splashing cards like Wizard from being placed with the Giant. often I will use a skeleton and goblin card (3 mana) to kill a giant/prince/hog rider/etc. This gives me a mana advantage that I can (usually) cash in immediately for a push since most of my units didn’t die in this exchange. I just reinforce whats already there with a dragon or witch. Since your deck cycles, and you never run out of cards, you don’t have to worry about card advantage as you would in other games such as Magic. Please don’t ever use the term mana again and secondly, please check out kairostime’s Tutorial on deck building, he talks about the card counter exception, which makes your cards basically worthless with a bad matchup 😀 check it out! It’s the first 3 about Arrows or Fireball, it’s just so easy to get ahead landing these spells in a good spot.